Qt 3D Wireframe Rendering illustrates how to draw a single entity (a trefoil knot) using a custom set of shaders to implement a single-pass wireframe rendering method. The renderer aspect looks for entities that have some geometry, a material, and optionally a transformation. These are all specified in the form of subclasses of QComponent that have been exported to the QML engine in the form of Mesh, Material, and Transform. We use these components to create a custom QML item in TrefoilKnot.qml. To use components from other aspects, we would need to import the corresponding QML module, too. In addition to aggregating components, the Entity type can be used to group child objects together. This is analogous to how the Item type is used in Qt Quick 2. The Mesh component is very simple. We use its source property to load in a static set of geometry (such as vertex positions, normal vectors, and texture coordinates) from a file in the Wavefront Obj format. This data was exported from the Blender application. In addition to the Mesh element, Qt 3D also enables dynamic generation of per-vertex attribute data through C++ hooks that are called by the task-based engine. This allows components to be shared between multiple entities very easily. In this example, we have components for the transform and mesh that are contained within the TrefoilKnot custom type. The final component, of type Material, is provided by a property of the TrefoilKnot custom type. We will later customize the appearance of the entity. We use the TrefoilKnot custom type in main.qml to draw the trefoil knot on the screen. It is trivial to use multiple cameras and choose between them using the framegraph for all or part of the scene rendering. The Qt 3D engine in conjunction with the renderer aspect now has enough information to finally render our mesh using the material we specified. The property updates are noticed by the QNode base class and automatically sent through to the corresponding objects in the renderer aspect. The renderer then takes care of translating the property updates to new values for uniform variables in the GLSL shader programs. 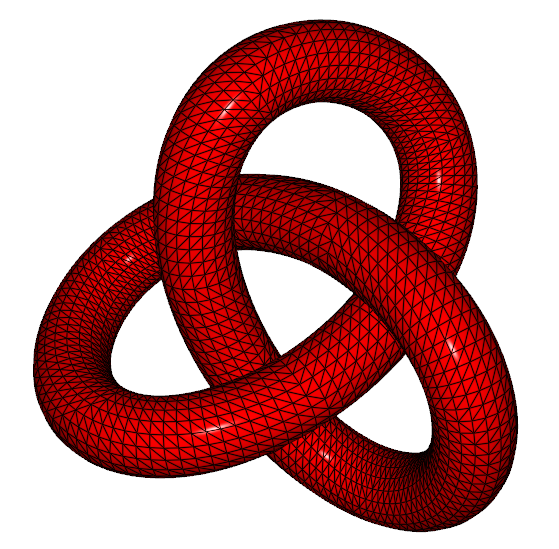 Run the example to view the trefoil knot with the width of the wireframe lines pulsing. All the heavy lifting is being done by the GPU. The CPU only has to run the property animations and to translate the scenegraph and framegraph into raw OpenGL calls. It is also possible to animate on the GPU via a custom shader program and material.